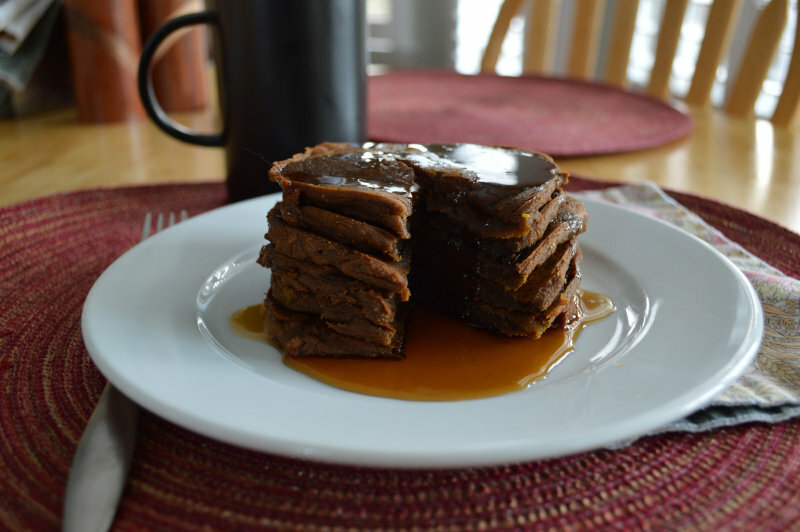 I have been waiting for so long to share this recipe for paleo autoimmune protocol (AIP) pumpkin spiced pancakes with you! Several months ago, my friend and fellow AIP blogger Eileen Laird invited me to participate in a collaborative effort to create a cookbook full of AIP recipes specifically for breakfast. I jumped at the opportunity, because I know from personal experience how hard it is to come up with satisfying and tasty breakfasts on a protocol that excludes not only grains and dairy, but also eggs and nuts. I contributed several of my existing recipes and then Eileen asked if I would try to create some kind of pancake that is AIP friendly and not reliant on plantains, since we know those aren’t available every where. It took a bit of trial and error, but I am thrilled with how these pancakes turned out. The wait is finally over! The cookbook is available as of January 1, 2015 and I have been given the OK to share this recipe with you as a special sneak preview of what you’ll find in this outstanding resource. 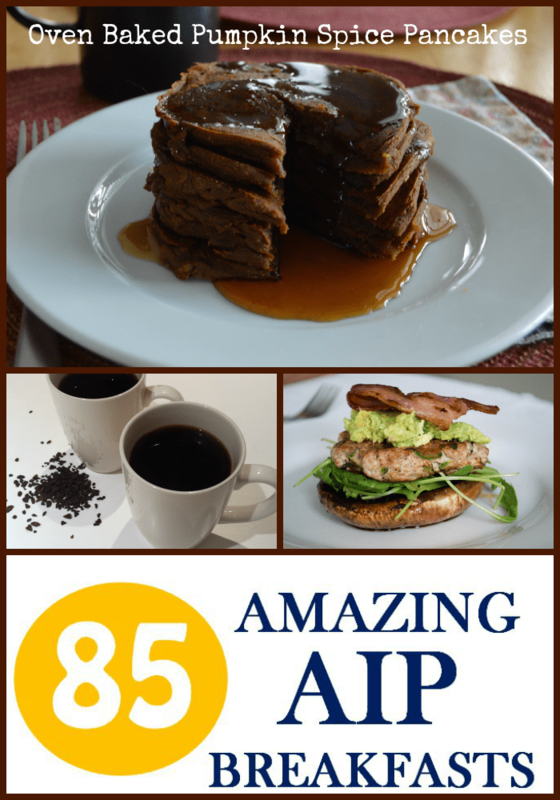 The cookbook is the work of 26 bloggers who have all used AIP to improve their own health. You’ll get the convenience of 85 curated recipes, including 33 that are not published anywhere else. Over half of the recipes can be easily modified for low-FODMAPs, SCD/GAPS, low-histamine, and coconut-free diets – so this is truly a resource for everyone who is using a healing diet to manage their autoimmune and other conditions. Click here to learn more and get your own copy immediately! In a food processor or high speed blender, puree dates, pumpkin, coconut oil, apple cider vinegar, and the gelatin and water mixture until smooth. Add sweet potato flour, baking soda, salt and cinnamon. Puree again until all ingredients are well combined (the batter will be thick – more like a cake than a traditional pancake). Make six roughly equal size pancakes on the cookie sheet – spreading them out so that each one is about ¼ inch thick. Serve with desired topping (maple syrup, honey, or coconut cream) or eat plain. You can purchase sweet potato flour in some health food stores and online. I created and tested this recipe with this brand from Barefoot Provisions. Regular grocery store gelatin will work here, but I recommend using quality gelatin made from grass fed beef like this one from Great Lakes. The batter for these pancakes is incredibly delicious! Unfortunately, the flavor becomes significantly muted during the cooking process, to the point where the pancakes themselves don’t taste like much to me. Do you have any suggestions for how to maintain the flavor of the original batter after cooking? I have made these multiple times and we love them! This last time we used 1/3 cup of date lady date syrup in place of the dates and the yum factor went up by at least 10 notches! This is how we’ll make it from here on out! Thanks for a fantastic recipe! Hi Jaime, Is there any substitute for the sweet potato flour? I have a reaction to potatoes and would love it if you could give me a couple other options. Much thanks. I’m sorry, I haven’t tried it with any other flours. I think it would probably work with the squash flour made by “Anti-Grain” flour, but you would need to experiment. These look great, but I am on a low sugar diet for candida. Any suggestions on what to substitute for the dates? I’m not sure… I think you could try another dried fruit, like prunes. But I’m afraid that will still be high in sugar. I am wondering what I did wrong. I used the exact measurements and ingredients called for. The batter was incredibly thick, stuck to the spoon in one big glob – way too thick for the vitamix blender, and nothing like cake batter. Next time I would use the food processor. I am curious about the directions for the gelatin. On the first try, I followed directions exactly, adding the gelatin to hot water, and that created a blob of gelatin. Most recipes I see call for adding gelatin to cold water and then dissolving in hot water. So, on my 2nd try, I added 2 T gelatin to 2 T cold water, and then added to 1/2 cup (less 2 T) of hot water. Not all of the gelatin dissolved. I’d love to hear people with success tell me how they may have altered the instructions. Thanks!